Strawberry Splashdown- Must Try In Pimm's! I was challenged by @dyerama to take an action shot with extra points if it is summery. 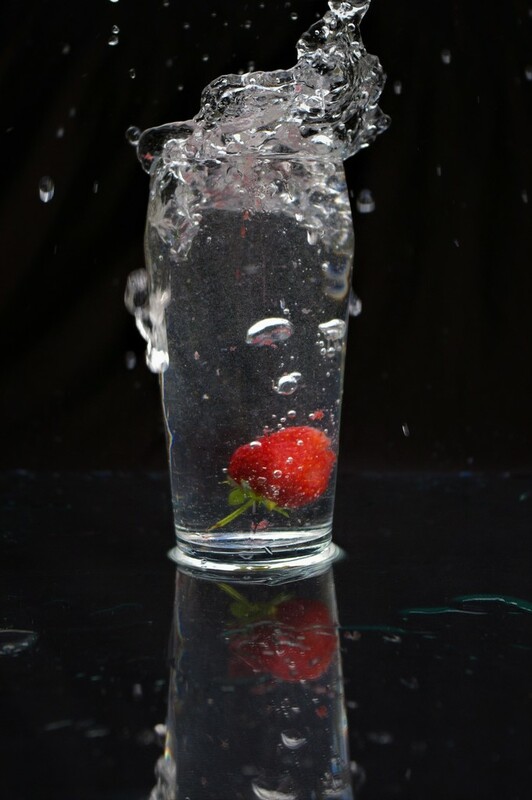 Well no street type action happenning around here and as it's not raining thought I'd gett Him to drop a summer strawberry into a pint glass of water and see what happened. @dyerama not sure what you were thinking of but it has actino and strawberries grow in summer!! cooling shot, having Pimms this weekend as all the kids are over.. i will try this! This is something I want to try, but not sure where to start! Pimms is a must!!!! @s4sayer I see a quiff now too! @brennieb don't waste Pimm"s doing this!!! Am I the only one to see a face here? The two big bubbles on in the middle of the glass are the eyes, the little bubble just below is the nose, and the strawberry is the mouth saying 'ohh'! To top it off, the big frothy bubbles on top is the hair - very similar to the way Elvis Presley wore his! Nice shot with the reflection and such and a FAV! @farmreporter - with an ear, yes? Yep - there's an ear as well - and I guess I wasn't the only one to see the face. Oops! Super shot - love the liquid exploding out the top. What a great fun shot, meant to be. Fav. It's the face that makes this... serendipity in action. It's great to see such an action shot which is fun as well. To get a "face" as well is indeed serendipity. FAV. @farmreporter no face seen by us and others before you! Did consider renaming photo Elvis!! @suzanne234 it was rather yucky after dropping in the strawberry a couple of times- quite undrinkable with blobs in it!! @robz glad did outside- the mess was amaxing! @bri123 will try again- now looked on google how to do this type of shot!! @vignouse Thanks Richard- as you say flukey luck!! @fbailey It was a good laugh doing this! @suesouthwood I am v chuffed- you're right Pimms would be wasted!! @pistache thank you - it was such fun- now I want to have another go as I've Googled the technique! @merrelyn thank you - pure fluke and luck!! Quite creepy in a way! But very clever to get a splash shot I have never attempted it. The first thing I saw was the face! I thought you were amazing how you did that!.... then reading the comments I realised it was luck!...... It's still amazing though! @janemartin most if my successful photos boil drown to luck!!!! @wylieclicks oh do!!! But outside as it's such messy fun! Nursery school at the age of 59 was great fun!!!! Very creative. So simple, yet effective.